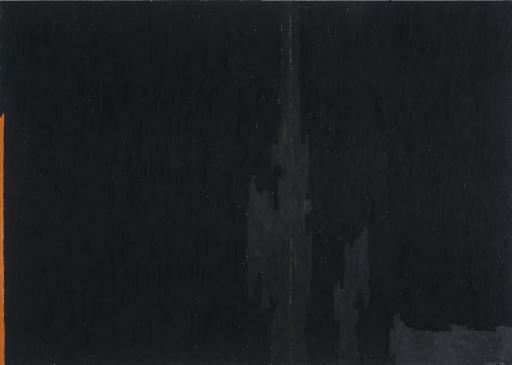 Clyfford Still, PH-1078, 1951. Oil on canvas, 113 x 158 inches (287 x 401.3 cm). Clyfford Still Museum, Denver, CO.
Benezra, Neal. "Clyfford Still's Replicas." In Clyfford Still: Paintings, 1944-1960 (exhibition, Hirshhorn Museum and Sculpture Garden, Washington, D.C., June 21-September 16, 2001), edited by James T. Demetrion, 87–98. Washington, DC: Hirshhorn Museum and Sculpture Garden, Smithsonian Institution, 2001. Sobel, Dean. "Why a Clyfford Still Museum?" In Clyfford Still Museum: Inaugural Publication, 21–67. Denver: Clyfford Still Museum, 2012. Benezra, Neal. "Clyfford Still's Replicas." In Repeat/Recreate: Clyfford Still's "Replicas", Clyfford Still Museum, 11–35. Denver: Clyfford Still Museum Research Center, 2015; cited in Anfam, David. "Repeat/Recreate: Still's Multiplying Vision." In Repeat/Recreate: Clyfford Still's "Replicas", Clyfford Still Museum, 37–57. Denver: Clyfford Still Museum Research Center, 2015, p. 43.